Cookie lovers, the folks at Sweet Tooth Design had you in mind when they came up with their latest project. 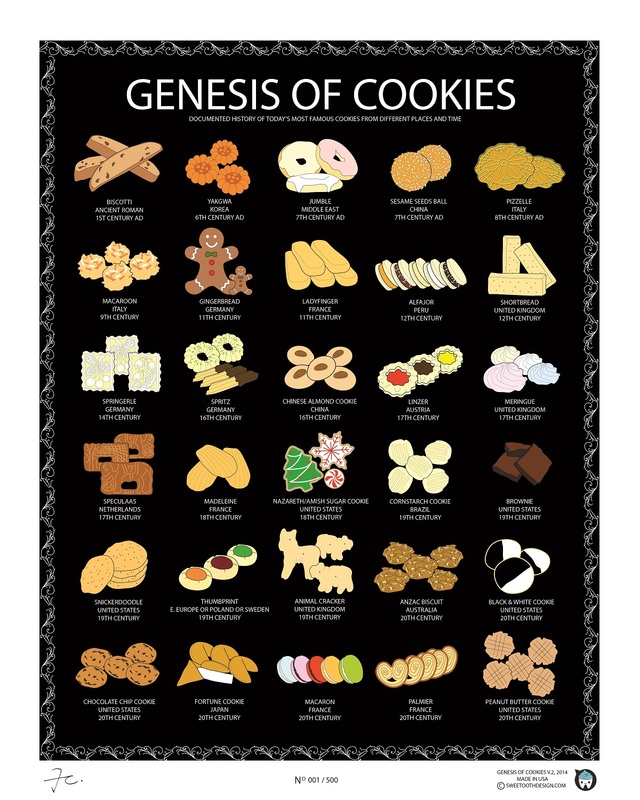 Genesis of Cookies is a gorgeous infographic that breaks down the history of 30 famous cookies. Here's how they came up with the yummy poster: "Out of curiosity SweeTooth Design went onto research and collect documented history for cookies. The finding contains long lists and details of cookies, which many people may not have the time to read. Eventually we continue with a simpler way to bring food knowledge and history by designing the first cookie history poster." Among the historic gems pictured in the poster are biscotti, which date back to the 1st century AD. One of the oldest cookies in Latin America are Peruvian alfajores which date back to the 12th century. Sumptuous French macarons? They only arrived on the scene in the 20th century. Check out more amazing cookie facts below. If you are interested in buying this poster, it comes in black or white and retails for $15 on Kickstarter.